The most crucial game of the last day was a loss of top-ranked Windy City Bulls (19-17) in Grand Rapids on Saturday night. Visitors were rolled over by third ranked Drive (17-18) 113-92. It ended at the same time the four-game winning streak of Windy City Bulls. It may be a crucial game in the contest for the top position in the league. They outrebounded Windy City Bulls 60-47 including 18 on the offensive glass. Drive looked well-organized offensively handing out 26 assists. Great defensive blocking was one of the keys in this match when Drive made 7 blocks. Point guard Kalin Lucas (185-89, college: Michigan St.) orchestrated the victory by scoring 35 points (!!!) and 7 rebounds. Trinidad and Tobago center Johnny Hamilton (213-94, college: Texas Arlington) contributed with 22 points and 13 rebounds for the winners. Drive's coach felt very confident that he used 10 players which allowed the starters a little rest for the next games. Forward JaKarr Sampson (206-93, college: St.John's) answered with a double-double by scoring 21 points and 11 rebounds for Windy City Bulls. Drive have a solid series of four victories in a row. They moved-up to second place, which they share with Salt Lake City S. Windy City Bulls at the other side still keep top position with 17 games lost. Important game to mention about took place in Mississauga. Fifth ranked Maine Red Claws (13-21) saved a 1-point victory on the road edging second-ranked Raptors 905 (21-13) 99-98 on Saturday evening. Forward John Bohannon (210-91, college: UTEP) stepped up with a double-double by scoring 14 points, 17 rebounds and 5 assists for the winners and RJ Hunter chipped in 23 points and 5 assists. Forward Derek Cooke-Jr (206-91, college: Wyoming) responded with a double-double by scoring 16 points, 17 rebounds and 4 assists. Maine Red Claws maintains fifth place with 13-21 record. Defending champion Raptors 905 keeps the second position with 13 games lost. They share it with Stockton K..
A very close game took place in Erie between Greensboro Swarm and Erie Bay Hawks. Fourth ranked Greensboro Swarm (17-17) got a very close victory on the road over 3rd placed Erie Bay Hawks (17-17). Greensboro Swarm managed to escape with a 2-point win 112-110 in the game for the third place. Joe Chealey nailed 25 points, 5 rebounds, 9 assists and 4 steals for the winning side. Greensboro Swarm's coach used a ten-player rotation in such tough game. Jordan Sibert came up with 22 points for Erie Bay Hawks in the defeat. Greensboro Swarm moved-up to third place, which they share with Erie Bay H. Erie Bay Hawks lost third consecutive game. An interesting game for Blue Coats (13-19) which played road game in Des Moines against their close opponent Wolves (13-24). Fourth ranked Blue Coats had an easy win 134-111. It ended at the same time the four-game winning streak of Wolves. The best player for the winners was Jared Brownridge who scored 25 points and 8 assists. Blue Coats' coach felt very confident that he used entire bench and allowed the starting five to rest. Blue Coats maintains fourth place with 13-19 record which they share with defeated Wolves. Wolves at the other side keep the fourth position with 24 games lost. An interesting game for Hustle (21-15) which hosted in Southaven 4th placed Texas Legends (13-24). Third ranked Hustle had an easy win 115-94. Tyler Harvey orchestrated the victory by scoring 30 points and 7 assists. Texas Legends' coach gave up on the game allowing to play eleven players seeing no chance for a win. Hustle have a solid series of three victories in a row. They maintain third place with 21-15 record having just one point less than leader Windy City B. Loser Texas Legends keep the fourth position with 24 games lost. There were no big surprises in other games of day 89: Capital City Go-Go were smashed by Lakeland M. on the road 117-91. Stockton K. destroyed Sioux Falls S. on its own court 126-107. Westchester K. managed to outperform Long Island N. in a road game 134-130. A very close game took place in Erie between Greensboro Swarm and Erie Bay Hawks. Fourth ranked Greensboro Swarm (17-17) got a very close victory on the road over 3rd placed Erie Bay Hawks (17-17). Greensboro Swarm managed to escape with a 2-point win 112-110 in the game for the third place. Greensboro Swarm looked well-organized offensively handing out 23 assists. Guard Joe Chealey (190-95, college: Charleston) nailed 25 points, 5 rebounds, 9 assists and 4 steals for the winning side and guard Jaylen Barford (191-96, college: Arkansas) accounted for 22 points and 12 rebounds. Greensboro Swarm's coach used a ten-player rotation in such tough game. Guard Jordan Sibert (193-92, college: Dayton) came up with 22 points and forward Alex Poythress (203-93, college: Kentucky) added 16 points and 9 rebounds respectively for Erie Bay Hawks in the defeat. Four Greensboro Swarm and five Erie Bay Hawks players scored in double figures. Greensboro Swarm moved-up to third place, which they share with Erie Bay H. Erie Bay Hawks lost third consecutive game. An interesting game for Blue Coats (13-19) which played road game in Des Moines against their close opponent Wolves (13-24). Fourth ranked Blue Coats had an easy win 134-111. It ended at the same time the four-game winning streak of Wolves. Blue Coats players were unselfish on offense dishing 32 assists. The best player for the winners was guard Jared Brownridge (190-94, college: Santa Clara) who scored 25 points and 8 assists. Rashad Vaughn (198-96, college: UNLV) chipped in 29 points. Blue Coats' coach felt very confident that he used entire bench and allowed the starting five to rest. Forward Hakim Warrick (206-82, college: Syracuse) produced a double-double by scoring 19 points and 16 rebounds and guard Brandon Goodwin (188-95, college: FGCU) added 21 points, 8 rebounds and 4 assists respectively for the hosts. Four Blue Coats and five Wolves players scored in double figures. Blue Coats maintains fourth place with 13-19 record which they share with defeated Wolves. Wolves at the other side keep the fourth position with 24 games lost. The most crucial game of the last day was a loss of top-ranked Windy City Bulls (19-17) in Grand Rapids on Saturday night. Visitors were rolled over by third ranked Drive (17-18) 113-92. It ended at the same time the four-game winning streak of Windy City Bulls. It may be a crucial game in the contest for the top position in the league. They outrebounded Windy City Bulls 60-47 including 18 on the offensive glass. Drive looked well-organized offensively handing out 26 assists. Great defensive blocking was one of the keys in this match when Drive made 7 blocks. Point guard Kalin Lucas (185-89, college: Michigan St.) orchestrated the victory by scoring 35 points (!!!) and 7 rebounds. Trinidad and Tobago center Johnny Hamilton (213-94, college: Texas Arlington) contributed with a double-double by scoring 22 points and 13 rebounds for the winners. Drive's coach felt very confident that he used 10 players which allowed the starters a little rest for the next games. Forward JaKarr Sampson (206-93, college: St.John's) answered with a double-double by scoring 21 points and 11 rebounds and guard Antonio Blakeney (193-96, college: LSU) added 15 points and 11 rebounds in the effort for Windy City Bulls. Four Drive and five Windy City Bulls players scored in double figures. Drive have a solid series of four victories in a row. They moved-up to second place, which they share with Salt Lake City S. Windy City Bulls at the other side still keep top position with 17 games lost. An interesting game for Hustle (21-15) which hosted in Southaven 4th placed Texas Legends (13-24). Third ranked Hustle had an easy win 115-94. Hustle dominated down low during the game scoring 76 of its points in the paint compared to Texas Legends' 50. Hustle had a 38-27 advantage in offensive rebounds. They looked well-organized offensively handing out 24 assists. Guard Tyler Harvey (193-93, college: E.Washington) orchestrated the victory by scoring 30 points and 7 assists. British-American guard Tarik Phillip (190-93, college: W.Virginia, agency: Two Points) contributed with 17 points and 8 rebounds for the winners. 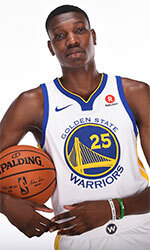 Greek forward Kostas Antetokounmpo (208-98, college: Dayton) answered with 16 points and 6 rebounds and guard Keith Hornsby (193-92, college: LSU) added 16 points and 5 rebounds in the effort for Texas Legends. Both teams had five players each who scored in double figures. Texas Legends' coach gave up on the game allowing to play eleven players seeing no chance for a win. Hustle have a solid series of three victories in a row. They maintain third place with 21-15 record having just one point less than leader Windy City B. Loser Texas Legends keep the fourth position with 24 games lost. The game between closely ranked teams ended with first ranked Magic's (23-12) home victory over second-ranked Capital City Go-Go (18-16) in Lakeland 117-91 on Saturday. Magic looked well-organized offensively handing out 24 assists. Capital City Go-Go was plagued by 25 personal fouls down the stretch. Swingman BJ Johnson (201-95, college: La Salle) orchestrated the victory by scoring 27 points and 5 rebounds. Guard Troy Caupain (193-95, college: Cincinnati) contributed with 10 points, 8 rebounds and 8 assists for the winners. Coach 's team controlled all game and the coach could let to play 10 players saving starting five for next games. Point guard Peshon Howard (190-90, college: USC) answered with 19 points and 5 rebounds (was perfect 9-for-9 from the free throw line !!!) and guard Chris Chiozza (183-95, college: Florida) added 14 points, 8 rebounds and 5 assists in the effort for Capital City Go-Go. Five Magic and four Capital City Go-Go players scored in double figures. Magic have a solid series of three victories in a row. They maintain first place with 23-12 record. Capital City Go-Go lost third consecutive game. Newly promoted team keeps the second position with 16 games lost. There was a minor upset when their close opponent Sioux Falls Skyforce (23-15) was smashed by second ranked Kings (21-13) in Stockton 126-107 on Saturday. Kings looked well-organized offensively handing out 34 assists. Great defensive blocking was one of the keys in this match when Kings made 7 blocks. Guard Reggie Hearn (193-91, college: Northwestern) orchestrated the victory with a double-double by scoring 21 points, 9 rebounds and 10 assists. Guard Cameron Reynolds (203-95, college: Tulane) contributed with 29 points for the winners. Point guard Jarvis Threatt (188-93, college: Delaware) answered with 27 points, 5 rebounds and 4 assists and forward Emanuel Terry (206-95, college: Lincoln Memorial) added 15 points, 15 rebounds and 4 assists in the effort for Sioux Falls Skyforce. Five Kings and four Sioux Falls Skyforce players scored in double figures. Sioux Falls Skyforce's coach rotated ten players seeing no chance for a win. Kings maintains second place with 21-13 record having just three points less than leader Windy City B., which they share with Raptors 905. Loser Sioux Falls Skyforce keeps the second position with 15 games lost. There was a small surprise when third ranked Knicks (21-16) won against leader Long Island Nets (22-13) in Uniondale 134-130 on Saturday. Knicks dominated down low during the game scoring 96 of its points in the paint compared to Long Island Nets' 64. Knicks forced 20 Long Island Nets turnovers. They looked well-organized offensively handing out 28 assists. Great defensive blocking was one of the keys in this match when Knicks made 10 blocks. Guard Billy Garrett (198-94, college: DePaul) orchestrated the victory with a double-double by scoring 39 points (!!!) and 12 assists. Swingman Zack Irvin (198-94, college: Michigan) contributed with a double-double by scoring 25 points and 14 rebounds for the winners. Knicks' coach allowed to play the deep bench players in such tough game. Bosnian Dzanan Musa (200-99, agency: BeoBasket) answered with a double-double by scoring 30 points, 11 rebounds and 6 assists and forward Theophilus Pinson-Jr (198-95, college: N.Carolina) added 21 points, 6 rebounds and 7 assists in the effort for Long Island Nets. Both teams had five players each who scored in double figures. They have a solid series of three victories in a row. Knicks maintains third place with 21-16 record despite having the same number of points like the leader Windy City B. Long Island Nets lost third consecutive game. They still keep top position with 13 games lost. Important game to mention about took place in Mississauga. Fifth ranked Maine Red Claws (13-21) saved a 1-point victory on the road edging second-ranked Raptors 905 (21-13) 99-98 on Saturday evening. Maine Red Claws brought some defensive toughness making 8 blocks. Forward John Bohannon (210-91, college: UTEP) stepped up with a double-double by scoring 14 points, 17 rebounds and 5 assists for the winners and guard RJ Hunter (198-93, college: Georgia St.) chipped in 23 points and 5 assists. Forward Derek Cooke-Jr (206-91, college: Wyoming) responded with a double-double by scoring 16 points, 17 rebounds and 4 assists and guard Josh Adams (188-93, college: Wyoming) scored 23 points, 5 rebounds and 7 assists. Five Maine Red Claws and four Raptors 905 players scored in double figures. Maine Red Claws maintains fifth place with 13-21 record. 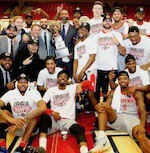 Defending champion Raptors 905 keeps the second position with 13 games lost. They share it with Stockton K..